Successful businesses need a robust approach to customer relationship management (CRM), which can result in the generation of greater value for customers with complete satisfaction, within the allocated time, resource and budget. With the pace competition is increasing, it is paramount for companies to formulate appropriate strategies, keeping in mind the continuously changing needs of customers. Integrating various tasks and activities that can turn a customer into a prospective buyer, finding ways for encouraged business-customer interaction, creating offers and campaigns and communicating it to customers, brand positioning and many other such tasks become complicated and inefficient as well, when handled manually. 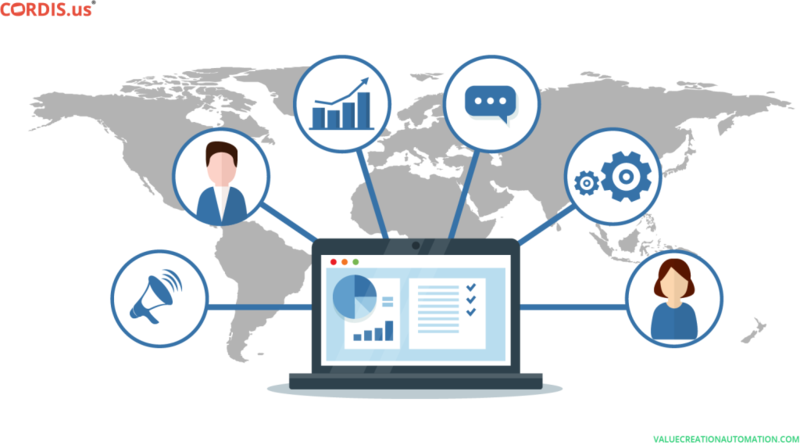 Therefore, businesses across the world are implementing advanced CRM software, which is designed to help in using the customer database to generate healthy leads and enhance sales. Value Creation Automation (VCA) is one such world’s leading process management software, which consists of an inbuilt CRM solution. 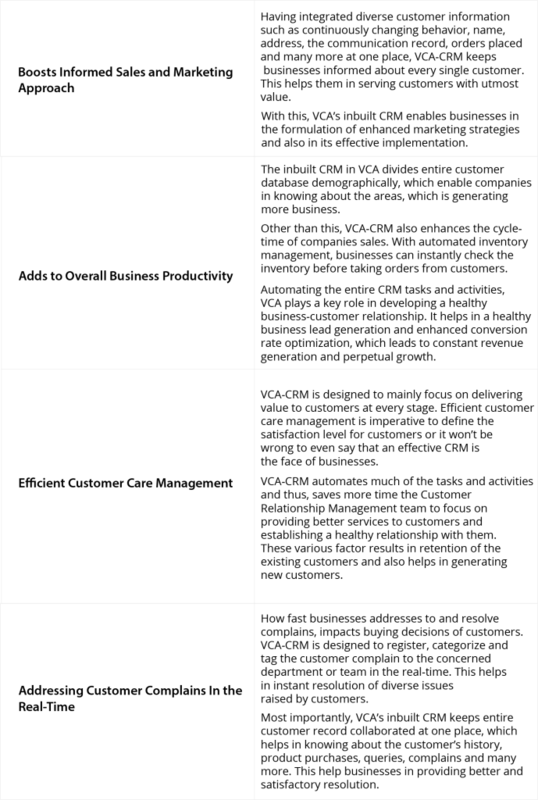 What is VCA-CRM? VCA-CRM helps businesses in creating a platform that supports healthy interaction and a personalized relationship with customers. It streamlines entire tasks pertaining to customer relationship management (CRM) and also gives enhanced customer insights. 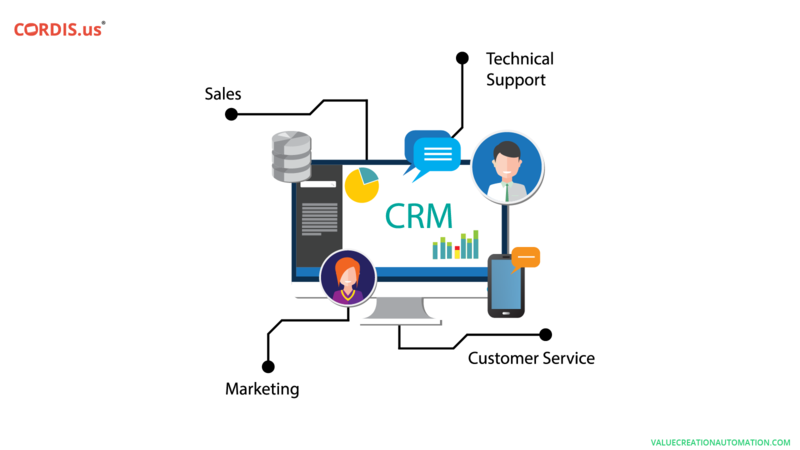 With evolving technologies, now technical support, sales, marketing, and other activities that connect process, people, and technology to make optimum use of customer relationship has become an integral part of advanced CRM software. Supporting both cloud and Software-as-a-Service (SaaS), Value Creation Automation (VCA) is designed to automate the CRM process for SMEs as well as Large Enterprises. Developed by Cordis Technology, VCA implement a robust approach to customer relationship management (CRM), which play a key role in driving overall business performance. Following is 10 of the main reasons that make Value Creation Automation (VCA) and its inbuilt CRM beneficial for businesses. According to a report published by superoffice.com, in the year 2008, approximately 88% of the businesses used On-Premises CRM software, whereas in the contemporary market scenario it has reduced to only 13%. Approximately 87% of the businesses, today, use cloud-based CRM software. And, this indeed gives a positive sign for the exponential growth of ERP software such as VCA, which consists of an inbuilt CRM. So now, the point is — how do Value Creation Automation (VCA), a cloud-based CRM software, benefits SMEs as well as Large Enterprises in harnessing benefits of evolving technologies? Offering could-based CRM solution, VCA significantly supports companies in reducing costs incurred on business operations. It prevents from installing software, hardware and incurring additional costs on maintaining servers. Entire customer database, I.e. addresses, contacts, communication details and other relevant information is saved in the cloud, which can be accessed anywhere and anytime with help of the Internet. With VCA-CRM, tasks and activities pertaining to maintaining customer relations become flexible and reliable as well. Being a cloud-based CRM software, VCA enhances agility and scalability of businesses. It enables Managers and other authorized employees to have instant access to customer data and to take the required action, by logging-in through various electronic devices such as mobile phones and tablets, anywhere and anytime. Offering cloud-based CRM solution, VCA ensures the availability of businesses across all fronts, which marks the active presence of customers round the clock. With this, companies can instantly encase any opportunity that can lead to building a healthy business-customer relationship and generating revenue. VCA-CRM is uniquely designed and has an edge over many other advanced CRM software. It consists of a flexible structure, which allows businesses in customizing it according to changing customer-behavior and their preferences. With VCA-CRM, companies can optimize task and activities to achieve enhanced transparency level, which can help in building credibility among customers. And with this, businesses can remain assured of constant growth and development.